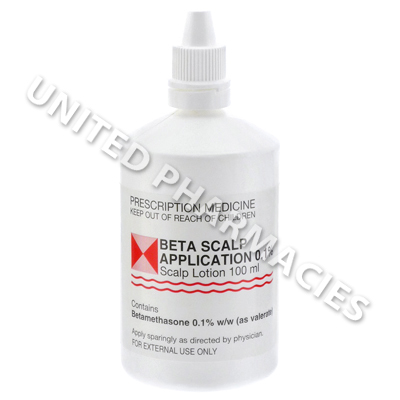 Beta Scalp Application (Betamethasone Valerate) is a topical corticosteroid lotion that is used to treat skin problems affecting the scalp, such as eczema, psoriasis and inflammation occurring as a result of severe dandruff. Beta Scalp Application (Betamethasone Valerate) is a topical corticosteroid lotion that is used to treat skin problems affecting the scalp, such as eczema, psoriasis and inflammation occurring as a result of severe dandruff. This lotion is considered ideal for treating skin conditions on the scalp as it is not as thick as ointments or creams, and is also relatively easy to apply. As the active ingredient in this scalp lotion is a potent steroid, it is usually only recommended by doctors when other corticosteroids fail to effectively relieve symptoms of eczema or psoriasis. Treatment with this lotion aims to act rapidly and relieve irritation, inflammation and itching. Beta Scalp Application (Betamethasone Valerate) is usually not used on a long term basis. All patients will be given strict application instructions by their doctor before beginning treatment. Adults are usually told to apply the lotion to the scalp twice per day (in the morning and night). If the symptoms improve, the doctor may tell the patient to reduce application of the lotion. Patients who are washing the hair should ensure that the hair is thoroughly dry before application of the topical lotion, and it is also important to ensure that the product is only applied to the scalp and that the hands are washed after application. You should inform your doctor if any side effects occur. If any rare but serious reactions are noticed, seek medical care straight away. This lotion is for external use on the scalp only. If you accidentally swallow it, seek medical attention immediately. Ensure that the lotion does not run down from the scalp to the face or eyes and do not apply it to skin that is broken. Always use Beta Scalp Application (Betamethasone Valerate) as you have been prescribed by your doctor. Never self-medicate or change your dosage without first consulting your doctor. The correct dosage can vary depending on your health, medical history, and the severity of the condition being treated.